How to Train Your Dragon is a DreamWorks animation (Shrek, Monsters vs Aliens) that is just about as good as anything Pixar have ever produced. The animation is stunning and the sound is just plain awesome. When the biggest dragons are flying, the beat of their wings can literally be felt in your chest on a good home cinema as the sub-woofer moves the air around your room. The flying scenes are absolutely tremendous on a big screen, resembling the best of similar scenes in James Cameron's Avatar. The only problem with a film like this is that even a 42” TV just isn't big enough for this kind of epic content. If I have any complaint at all, its that the Vikings have Scottish accents, but a look at the list of voice talent shows half the cast of Superbad and some other interesting names too - Gerard Butler, Jonah Hill, Christopher Mintz-Plasse and David Tennant to name just a few. The lead character, an outcast Viking boy is seen as an embarrassment by his fellow Vikings - he’ll never kill a dragon (he doesn't want to). 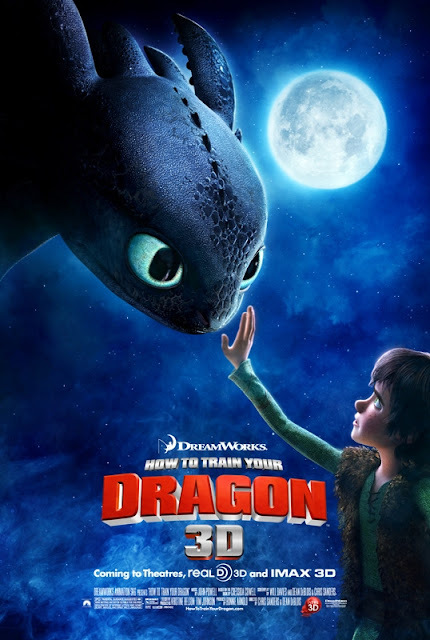 The story follows the ‘secret’ friendship he develops with one of the most feared breed of dragons around, and its actually quite a touching tale; testament to the power of the animators and the facial expressions they are able to create. They really bring the characters to life, it's even easy to understand the emotions in the face of the dragon - a fictional creature. I have nothing but respect for the people who create these kinds of movies. I just love them. Sadly I wasn't able to see this movie in 3D at the time, but now that I have seriously upgraded my home cinema kit I wouldn't hesitate for a second to pick this film up on 3D Blu-Ray. I'm sure it would look amazing on my new 59" Plasma.